GOGOVAN offers convenient and flexible same-day delivery services island wide – with the use of a mobile or web app. Within seconds, the app connects you with thousands of riders and drivers in Singapore. To try GOGOVAN for yourself, download the mobile app available on Android and iOS. Alternatively, you may place an order on our Website. Which service do I need for my goods? For small goods such as documents and parcels. Delivery Service is inclusive of door-to-door delivery. For goods under 3kg, within one parcel unit (30x20x20cm), a motorcycle will be assigned. For multiple parcel delivery, a sedan or van will be assigned. For large or bulky goods. Additional charge applies for door-to-door service. Transport Service entitles you to up to 1 hour* of loading and unloading time. Van: Suitable for large quantity of parcels and boxes, flower bouquets, plants, pets and furniture like single sized up to queen sized mattress, dismantled bed frame and sofas up to 2.4m long. 10 ft Lorry: Suitable for transporting large furniture and household items like king sized mattress, washing machine, fridge etc. 14 ft Lorry/24 ft Lorry: Suitable for moving house/office or event-based transportation needs. GOGOVAN mobile app – download the mobile app and start placing your order! For corporate deliveries, please head to our GOGOVAN for Business page to find out more. Alternatively, you may email [email protected] with your delivery requirements. How do I know if my item is one parcel size? 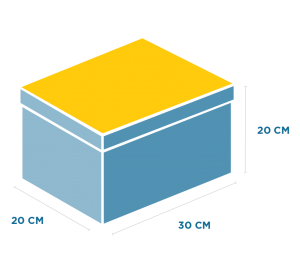 One parcel size (30x20x20cm) is roughly the size of a shoebox. Please call GoGoVan at 3590 3399 to inquire about any questions you may have that are not mentioned above.